Tall, broad, and possessing herculean strength and an indomitable nature, Gerta served as housekeeper, then nanny, for Angelcheeks’ parents. Gerta developed a strong attachment to the loving couple, then transferred that strong bond to their child. 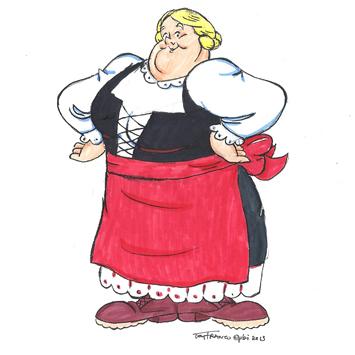 Gerta is a fearsome figure in defense of her charge, yet only the sweet smile of her beloved “liebchen” can turn this mountain of a woman to mush.